Tomorrow is the big day; Ellen and Reid will know of things early on. I suppose one aspect of a letter is to put things ‘out there’ and in some ways it’s easier to put ideas on paper than it might be in words. Ellen/Reid: To judge by the photo of you and Emma lounging in the pool with the Sea of Cortez behind you, Ellen, you got precisely what you wanted on the trip to Mexico. Reid, I assume you were out of camera range with a cold adult beverage in your hand. Of course, I need to hear all about the details, so don’t be too sparing about things. It truly was a cathartic trip for me. I left behind the events of the last 10 days by hitting the road on Thursday night and sleeping when I got tired at various rest stops all along the way. You’d be surprised at how hard I zonked out. It was amazing. I can’t recall ever doing such an overnight drive. Dave and I had a good time in Florida. The weather was warm, sunny and pleasant. The Camry rolled into Dave’s place about 10 a.m. I was refreshed and ready to go. We headed to his boat club to fish the Intracoastal but all we caught on our frozen shrimp were a few small pufferfish type things. The next morning we didn’t get on the water with the other kayakers, and as noted before, that was really no big deal. We did make it to the Captain’s party, which was great fun. 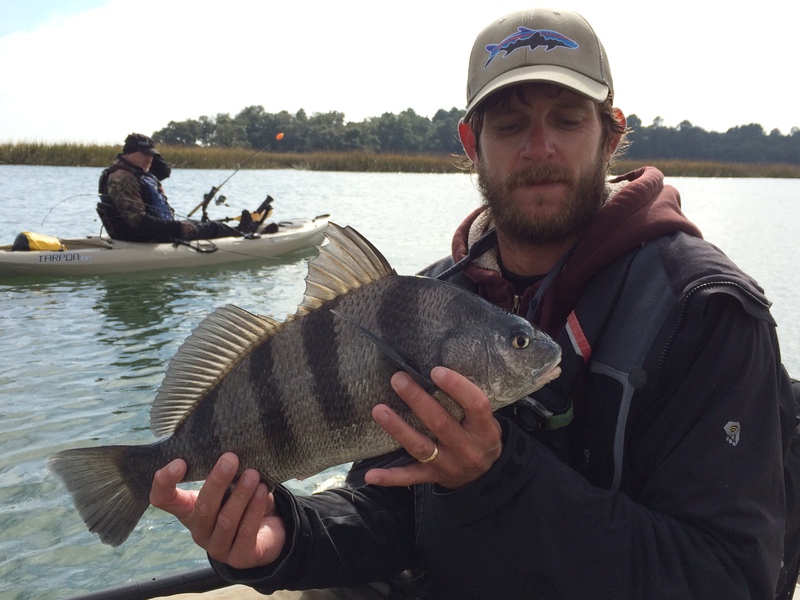 There are one hell of a lot of serious kayak fishermen. My little sparsely-outfitted kayak seems dorky compared to what real fishermen bring to the water’s edge. They sink some serious jack into their boats; fish finders, GoPros, live wells, weather radars and other expensive doo-dads. But it works. You only had to go to the morning launch of the tournament. 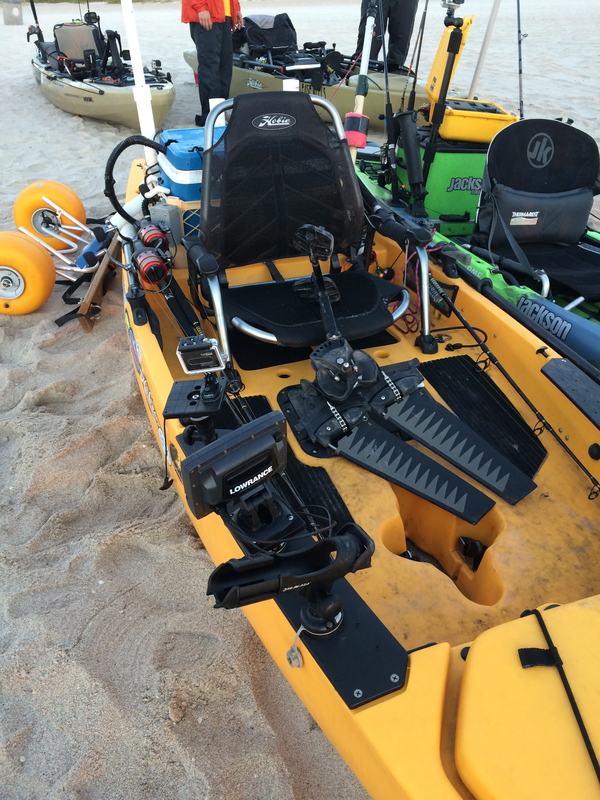 I mean, my rig is elementary (and far less costly) than the elaborate outfits we saw, from kayaks sporting live wells, two GoPro cameras, technology from depth indicators to fish finders, to other assorted – and expensive – gizmos. Our boats are naked compared to those. Maybe that’s why they catch fish and we don’t. On Sunday we ventured out into deep water, but aside from one strong jolt, we didn’t have any luck. We did intersect the small flotilla of kayakers. One guy was from Charlotte, and he’d landed the only sailfish among the group on Sunday. If his catch stood, he’d bank the $3,000 first place check. Dave and I weren’t entirely skunked; in the small pond out behind his house we caught a big 7 lb. bowfin, which is an ancient fish and highly edible although we allowed it to go free. But we agreed it was still great fun, and we’ll return next year to the Smackdown as bona fide entrants. I did buy some swordfish at the market this morning in observance of the tournament. The intent was to make it home ASAP on Monday, but when I was about to drive past the exit to Beaufort, South Carolina, the car made a sudden veer to the right and headed down Routes 17 and 21 in search of a place on the Intracoastal. I put in at Gray’s Hill Landing and paddled around for a few hours but didn’t land anything. It was some solace that three boats of locals didn’t report a single bite either. It felt like one of my better forays in terms of technique and baits and presentation. There were just no bites. My surgery is a week from today. The more I read, the more hopeful I become although I’m sure part of that is wishful thinking. Depth seems to be a big deal, and given the nickel-sized chunk of my right forearm removed during the ‘scoop’ biopsy, it’s no wonder the dermatologist wondered aloud if that procedure got all of it. She may get a call from me to reiterate what she told me just so I’m on the same page with her and the surgeon. His resume looks to be pretty extensive so that’s where my trust will go. One of the reasons I went down to Florida, and later kayak near Beaufort, was because I can either mope and whine, or get on with things. The latter seems much more preferable. If/when the surgery gets the ‘clear margins’ the docs and the literature talk about, then we’ll celebrate in style. I’ll head back down to ‘The Barge’ and fish with cut bait, Reid, like our new acquaintance Ryan. There won’t be any leaving without something on the stringer, and it won’t be small fry. We’ll come home with the real thing. When I got the news from my dermatologist, my mind instantly flashed back to my days as a lifeguard and pool manager in Omaha. Those were the days of baby oil and lemon juice as sun accelerators. If only I’d known better. Decades of unprotected golf didn’t help either. Ellen and Reid took the news well by phone, and they are hopeful of a good result. I’m hopeful – and confident – too. Ellen/Reid: Suffice to say, last week wasn’t one of the better ones in recent memory. I’m supposed to hear from the surgeon by mid-week and the dermatologist says I am to call her if I don’t hear from the guy. She really did a pretty nice job of breaking the news. That she called it a ‘thin melanoma’ was about all I needed to hear. That told me things could be worse and that it appears to be caught fairly early. .48 doesn’t sound very deep but it seemed plenty deep enough for me. It was something of dumb luck that I’d noticed the thing on my forearm and called, almost on a whim, and got in quickly due to a cancellation. Perhaps that’s divine providence. Friday night was spent at Macs, sipping on a Guinness and researching what I could about it. After 20 minutes of such, I’d had enough. According to the dermatologist, the surgery should occur sometime in the next couple weeks. There’s no idea of what it entails or how long I’ll be on the shelf from regular activities. It was really good to talk to you both about it, and you handled it better than your old man. I got up a little earlier than normal on Saturday, about 5 a.m., and tried to have ‘the talk’ with the Almighty as I walked along. I’m not very formal or very good at it. It was more of a one-sided conversation. My request wasn’t for healing, but for strength and patience. Later in the day I played golf with a couple friends and pushing the cart was therapeutic. 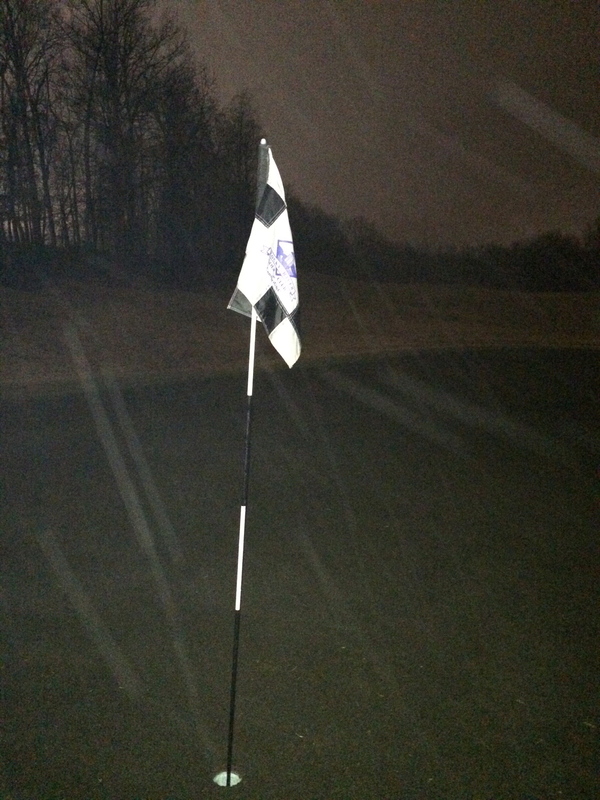 Golf was a good thing in that I didn’t want to sit around moping or surrendering to this thing, no matter how early in the process it is. I’m still heading to Florida this week for the Sailfish Smackdown although Dave is having no luck finding a rental fishing kayak. 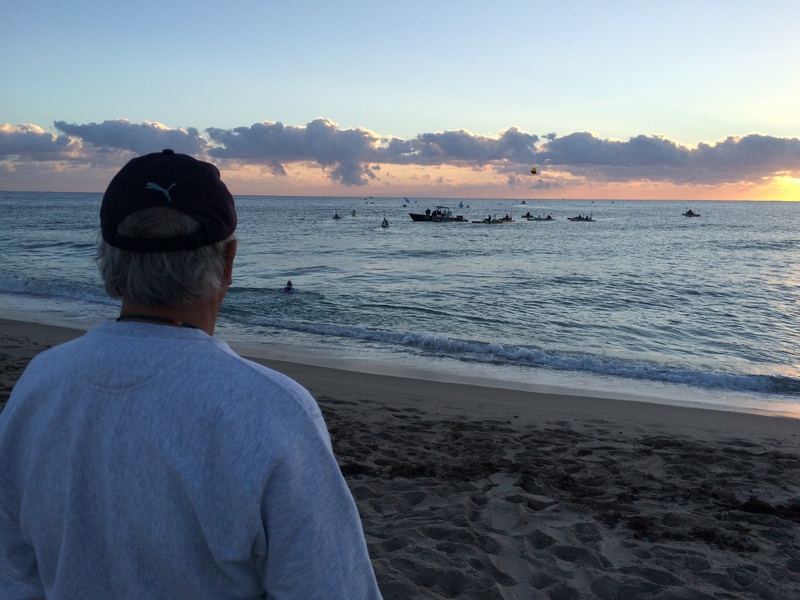 My friend Dave and I watched as more than 50 kayakers set off at Pompano Beach in their quest to catch the biggest sailfish. 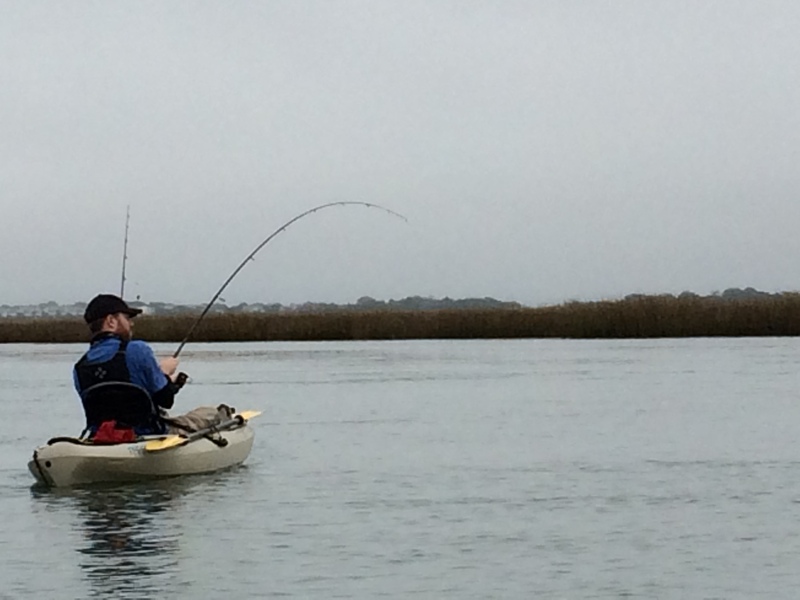 We stayed ashore – a rental fishing kayak wasn’t available for Dave. That was fine – we spent our time doing other things (including catching a 7 lb. bowfin – truly an ugly fish – behind his house). If he can’t, we’ll collect our ‘free’ tee shirts at the Captain’s reception on Friday night. I told him it didn’t bother me in the slightest to forego the tournament. Half the fun would’ve been paddling together in what would have likely been a fruitless attempt to catch a fish. We’ll find somewhere else to fish from a motorized boat and we might hire a guide, too. It really doesn’t faze me to not go on the open ocean. I hope you guys have a good time in Mexico. It really sounds fun, and I laughed at your comment, Ellen, that you wouldn’t leave your beach chair. Just be sure to use sunscreen. Ha. Looking at the temperatures up your way this morning, the warmth can’t come a moment too soon. It’s good that you’ll be with your mother because she will do things the right way. You’ll be in the air while I’m on the road to FLA-USA. Be sure to send pics. It’s dreary here today; rain and cold. But it’s January and one would suppose that’s how it should be. The temps should start a slow warm-up in the next couple of weeks as the days get progressively longer. At least that’s the hope. I’m sending a newspaper article from the Observer this morning to Mark Cady. It’s a column from a North Carolina supreme court member warning us of the politicization of our court system from our friends on the Right. In particular she objects to the influence of outside money to turn the courts more conservative. She thinks the general populace objects to this interference, and I hope she’s right. Perhaps that outside overreach is the worst news of the week. Yeesh. So this is what it’s like to get old. Some of that may seep through to the kids, but they’ll get another dose of it next week, too. Ellen/Reid: These past few days after the calendar turned to January have me on edge about next month. Maybe there is a traditional case of cold feet. But I woke up this morning thinking ‘What the hell?…’ Part of it might be that the bank turned me down flat on ‘retirement’ and instead coldly informed me that instead I’d need to submit a formal letter of ‘Voluntary Termination’ and that I’d need to turn in all my company gear, etc. I don’t meet the formal Rule of 60: 10 years of service and my age add up to 60 or more. It’s a bummer of sorts; they could’ve said ‘Congratulations on the pending retirement but here’s the downside …’ but they revert to bank-speak to break the news. I talk to John this week about the finances of it and I suppose none of this is really going to make be back away from the decision. Not that I’m expecting a gold watch or a frosted cake, but I’ll let you know how this all shakes out. We’re going from almost 70F yesterday to the icebox on Wednesday: 14F is the forecast low. Nothing much by your guy’s standard, but it should be the low point of low temps for us this season. At least one would hope so. Throw another log on the fire. This example of getting old didn’t make the cut in last week’s letter. In short, my golf cart tipped in heavy brush, spilling my iPhone and glasses. The phone was located, but I had to return – in the rain – at night to fumble in the undergrowth with a flashlight for the lost spectacles. Reid, I had a discussion last night with a woman about the ‘Cloud.’ I still don’t get it or understand what it is or why I should use it. My MacBook Air sends me repeated messages each day about how I can’t connect to iCloud due to something amiss with my email. Maybe I should do as you say, and simply stop being afraid and just dive in with experimentation about it. Technology just gives me the creeps but it’s time to get over that. Stopped at Bass Pro Shops the other day to check out some gear for the Sailfish Smackdown on Jan. 17-18. My current rods/reels can handle about 40 lbs. but what if I stumble upon a truly big fish in the 75 to 200 lb. range? It’d drag me to the bottom or to Bermuda, one of the two. 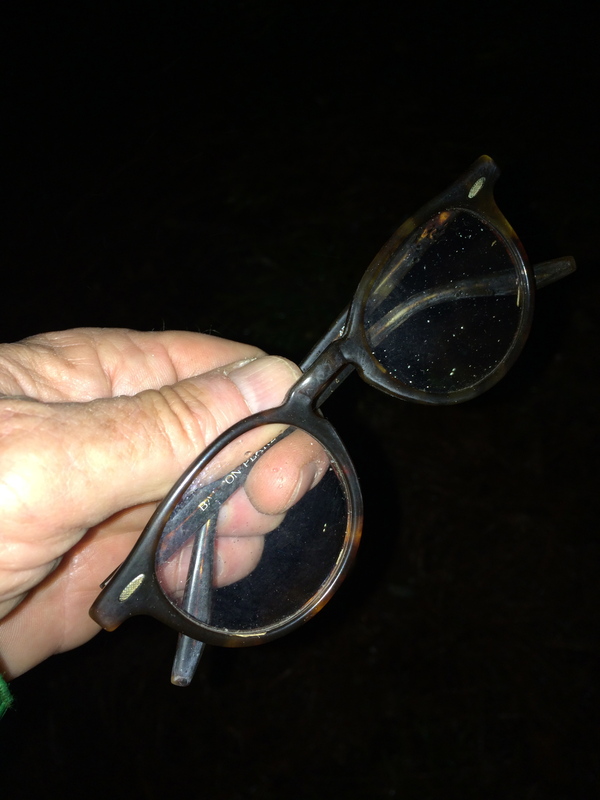 I’ll leave the evening of Jan. 15 and drive about 4 hours, hopefully as far as Savannah, to spend the night at some cheap motel, then head out early Friday morning to get to Dave’s place about 2 p.m.
After 30 minutes of searching, the glasses were finally located. What a ditz. There’s a Captain’s meeting about 3 p.m. which also appears to double as an extended cocktail hour. Seagoing men apparently like to drink and tell yarns. Hopefully no one will ask about my prior experience. This week I need to order a mandatory VHF radio so I can call in my catch or signal the Coast Guard for help, whichever comes first. You’re not supposed to take the fish out of the water at all. Once you hook it, you call the tournament folks and they come your way to eyeball what you got and then you release it, which is totally fine by me. The two of us aren’t holding our collective breathes about what we might boat. Personally, I don’t care what I catch. Whatever it is will be a personal triumph and another check off my bucket list of fish. Right now it’s a very short list. The local NFL team, the Panthers, won a playoff game and the whole town is agog about it. I hope they do well but I’d rather spend the day on the golf course or fishing from the kayak. The team plays at Seattle on Sunday night and the suspicion here is that they’ll get rolled. Bob F. asked me to ride the Harley to Arizona (he’d ride on his big BMW) but I told him that the first thing would be to be relatively close to Minn. for the birth of granddaughter #2. No doubt I will drive up this time. Ellen, I haven’t quite figured out the logistics of when to visit; there is the understanding the grandmothers come first and that’s fine by me. Tell me what your preference is and I will abide by it. Okay, hooligans. I’m back on the clock at work – and thinking about my ‘Voluntary Termination’ note. Geez. There comes a point when you sit at a bar with your children and it dawns on you that they’re old enough to consume adult beverages. Of course, Reid had his first beer in my presence when he was 16 at a bar in Australia. The latest father-son imbibing happened over the Christmas week in Charleston. The lad still knows how to handle a quaff, or two. Ellen/Reid: It was a great couple of weeks with you guys. That’s how the holidays ought to be celebrated. Thanks for the kayak fishing-related stuff. It’s really all that I wanted. Now it’s time for the fake tree to be disassembled and head back into its cardboard box and closet for another year. Reid, I’m still sorry about the lack of redfish for you. Man, that Todd just slammed them and part of that is on me for not knowing more about baits, finger mullet in particular. The redfish that got away from Reid – snagged, actually – was a behemoth. Next time we’ll return with Cap’n Tripp (charlestonoutdooradventures.com) at the helm. He’s a great guide. Cap’n Tripp will be a better option for us next time. He knows what he’s doing. If we had taken him, surely you would have caught the lunkers. Charleston sure was fun. It’s always crowded like that. There’s got to be a lot more to it beyond the touristy areas along Bay, Market and Meeting streets. Reid, you sure got the best of the weather. It was gorgeous almost the whole time. 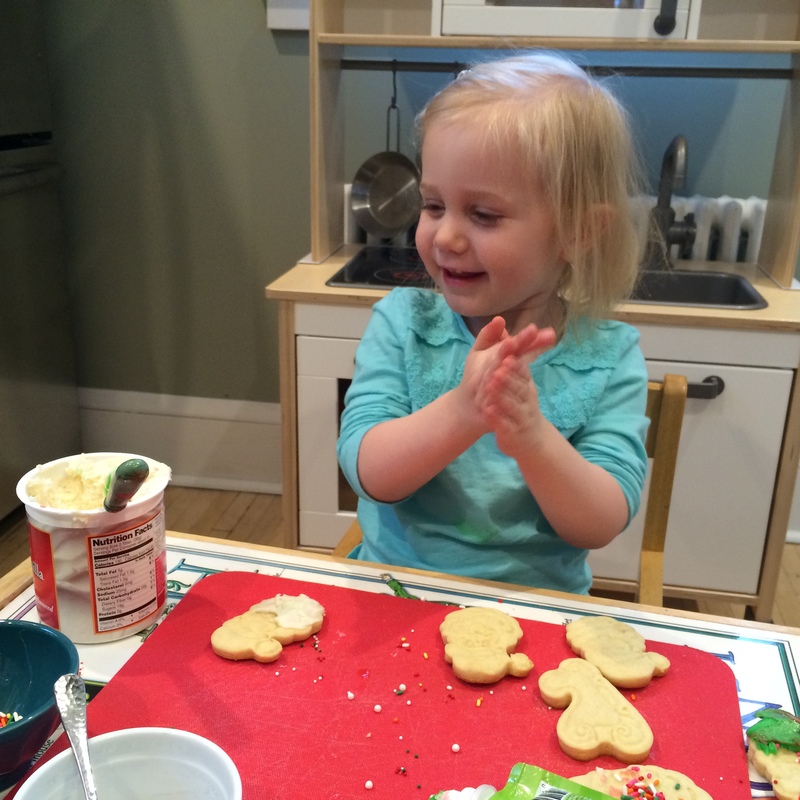 Emma is eminently pleased with the results of her first try at icing cookies. thanks for pushing me to do another batch for Emma after the first round got really over-toasted to the point of blackness. It was fun to watch her attempt at icing. She was just so proud of her handiwork. Santa no doubt found that her results still tasted good. I guess my next foray up North will be in April for the impending birth of the next little granddaughter. Reid, I’ll cruise through Chicago first and impose on you and Liz for one night. The plan is then to stop up in Des Moines and/or suburban Des Moines to look for a place. I’d really like to find something that has some sense of style rather than be slapped together. That’s what’s nice about what I have now; a great location and a sense of style. Too bad they don’t build with more brick in the Midwest. I’ve gotten used to it down in these parts. How long I idle in Des Moines is in part dependent on the birth; Ellen, it could also be that I don’t arrive for the birth itself since you guys will be up to your eyeballs in all the commotion. Your mom and Nancy likely have first dibs on doting on the new child. I don’t mind being there a bit afterward once things have settled down somewhat (‘settled down’ might be an impossibility for expanded families). You tell me what works best for you. I’ve volunteering at a recycling event this morning in Uptown just before the Belk Bowl between Louisville and Georgia. Hopefully the rain will stop before the game starts. The other big football news is the Panthers, who defied the odds by winning four straight at the end of the season after most people, me included, wrote them off. It still doesn’t mean, though, that I want to attend the games in person. TV works just fine. Thanks, too, Reid, for setting me up on NetFlix. Incredible.